In a large bowl, combine the flour, sugar, cocoa powder, baking powder, baking soda, and salt. 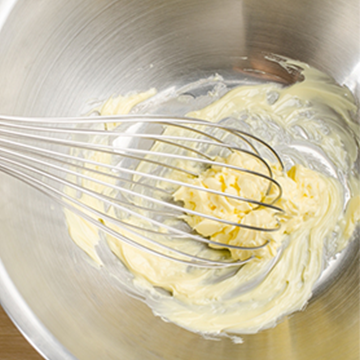 In a medium bowl, whisk together the buttermilk, sour cream, eggs, vanilla, and food coloring. Add the buttermilk mixture to the flour mixture, stirring until just combined. Fold in the chocolate chips. In a very large skillet or griddle over medium heat, melt the butter. Working in batches and adding more butter as needed, add the batter in 1/3-c. portions and cook until lightly browned, 1 to 3 minutes per side. Sprinkle with powdered sugar and serve, passing maple syrup at the table.